Crunch across the yard to an open airy barn, with tiled floors and modern furniture. Canvas parasols and loungers around the walled pool and a dappled shaded area to enjoy a drink or two after a lazy day. Four bedrooms, 2 ensuites and a family bathroom, and a large open plan living/dining kitchen with small cloakroom. Satellite tv. Gated private garden and secure parking. Large gardens and fields to explore, with horses, dogs, chickens, and goats nearby too! Aunac village 3kms, with a boulangerie, bar, Restaurant and shop, selling locally grown produce, pharmacy etc. Beautiful farming countryside to explore with sunflower fields as far as the eye can see. Pretty rivers to relax, wander by and enjoy. Many local market towns selling famous pine, cognac and cheese and the Cognac houses to visit not far away! Romanesque Churches, Summer Festivals, Plan D'Eaus (Lakes with beaches) all within easy reach, adventure parks and the Atlantic Coast an 2 hours away. For winter breaks, a woodburning log fire awaits you, to warm you after crisp winter walks and warming Pineau! Relaxed family owned property. Recently sympathetically converted gite to high standard retaining character charm and rural lifestyle. The area offers pretty countryside, cultural villages, beautiful walks and endless views, nature, rivers and lakes to sit by in the shade and picnic, bustling markets, vineyards and gastronomic delights. Contemporary open plan barn conversion. Retaining many original features set on the edge of a Charentais village amid peaceful rolling countryside. Beautifully created barn is ideally situated for your relaxing holiday in France. The interior has been carefully adapted to a high standard without losing its original charm and retains its original country flavour. Outside there are landscaped gardens with a sunny courtyard and inviting swimming pool. La Belle Lavande is named for the bountiful bushes of lavender within the walled gardens. Providing plenty of variety for young and old and can offer a holiday as relaxing or stimulating or you choose. Family Bathroom. Ensuite shower room to bedrooms 1 & 3. Downstairs Cloakroom. Open plan lounge dining room with 3 white leather modern sofas and satellite tv, stereo and large family dining table seating 8. Free Wi-Fi. French Style open plan freestanding kitchen with island unit and stools. Fridge Freezer, washing machine, dishwasher, electric oven and hob, butlers sink and microwave. Can be delivered and collected by local provider. There are golf courses in the area but all are 30 minute+ drive away. Beautiful 10 x 5 metre pool with roman steps and paved terrace all round. Walled and gated for security and privacy. Cleaned daily by owners at a time to suit you. Shaded seating area. From the start of 2017 season, we can offer 2 double bedroom, self contained separate gite in neighbouring property, providing family and friends independent accommodation - price approx. €250 per week. There are heaters in the bedrooms and living room should they be needed. Outside: There is a gravel terrace area with table and chairs and a canopy for when the sun is too fierce. There are loungers and canvas parasols around the pool. A pretty garden is allocated with shady seating areas and a play area for children. Cleaning / Towels / Linen / Maid service: Towels and bed linen are included and there is a washing machine if a change is required during your stay. For an additional charge, a cleaner can be arranged. Beach and swimming towels not included. Other: Cupboard at foot of the stairs with broom, vacuum etc. Kass is a very considerate host; there when you need her, but always respectful of your privacy. Whenever we needed something, she was able to sort it out for us, and was also extremely helpful and generous in making suggestions about the best places to go locally and what events were going on during our stay. The gite's also very well positioned - being only a few minutes from the main N10, you can quickly get to Poitiers to the north, or the fantastic Angouleme to the south. 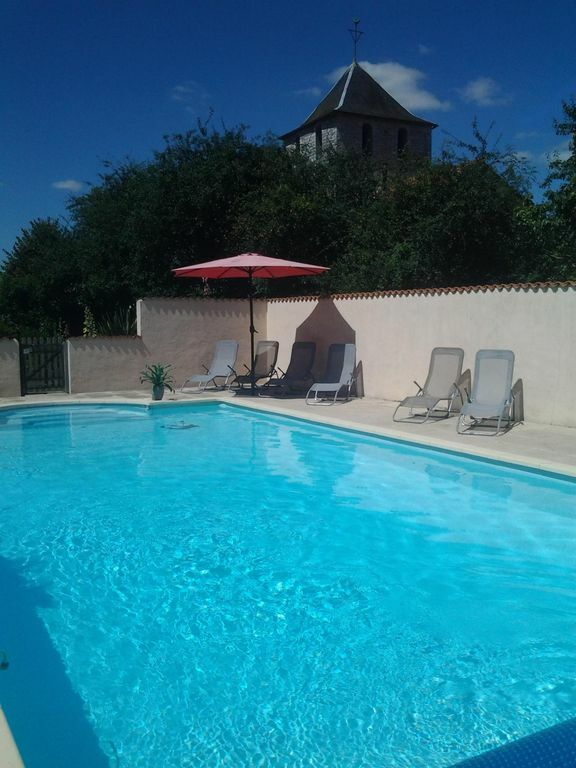 Beautiful relaxing gite - a perfect family holiday! We have just returned from the most relaxing 2 weeks holiday in a lovely part of France! The gite is beautifully decorated, airy, clean and has absolutely everything you would need for your holiday! The welcome basket on arrival was such a lovely touch and very appreciated! The large garden is beautiful and the pool is amazing-a great size and was lovely and clean! Just what we needed for cooling off in the hot hot weather we had during our stay! The whole place was perfectly safe for our two young sons who had an amazing time and loved seeing all the animals! Kass is an fantastic host! She is very friendly and nothing was too much trouble and she gave us lots of recommendations of brilliant places to visit with the kids and local events going on. The gite is in a beautiful rural area so was really peaceful and relaxing but still close to lots of lovely places to visit. Overall, we have had the best family holiday which exceeded all our expectations! We are already looking to see when we can book up to return! Would highly recommend to anyone! A Charming and delightful barn conversion. Absolutely charming. It oozes charm, the area is wonderful for walking the dog. The garden is fragrant with blooms of pale pink roses. The facilities are shabby chic perfection. Highly recommended. Good Wifi. And wonderful friendly host. Beautiful well equipped gite , in a stunning countryside setting. As a family of 8, with children ranging from 6 to 16 this holiday excided all our requirements . From the beautiful open plan living space to the gorgeous private pool and shaded areas that surround the property we truly needed for nothing in our 2 week stay . All our children were completely content and very relax , which is a tall order with 5 girls. Kass, Tim and Co couldn't of been more welcoming and extremely helpful . Always pointed us in the right direction whenever we needed info on local events, restaurants and general French life. We feel like not only did we find a beautiful spot in rural Charente but also made great friends for life . La belle lavendre is just perfect and we will most defiantly be returning soon. Once again we can't thank Kass & Tim enough for the perfect stay . To quote Wordsworth as cannot explain the beauty and calm of La Belle Lavande.Hosts extremely warm,hospitable and helpful. We were aparty ranging from 5 years old to 63 and everyone wanted to stay longer. Will one day be back. What a weeks stay! We will defiantly return. Chic rural retreat surrounded by countryside and villages. Spotlessly clean. Comfortable beds and 2 en suites perfect for groups. Crossed by the Charente river and its numerous affluents, the Charente département offers a wide range of attractions and activities with its landscapes of hills, vineyards, lakes, prairies and woods. With towns such as Angoulême, the French capital of the comic strip, and Cognac, famous for its brandy and its Detective film festival, as well as charming villages, castles and Romanesque churches, the Gallo-Roman site of Chassenon, and rivers and lakes for water sports, there is plenty on offer for visitors. La Belle Lavande Gite is situated in a small village, chenommet, Charente 16460. Limoges and Poitiers (Ryanair) airports are both within 60 minutes drive. La Rochelle is 90 minutes and offers a summer service from Gatwick. Caen/LeHavre are approximately 4.5 hours drive and Calais 406 miles away. A car is necessary. Aunac is a small rural village and is 3kms. Ruffec is 10kms and Poitiers (1hr) and Angouleme(20mins) within easy reach on the RN10. There are plenty of lakes and beaches within easy drives, a Monkey park and Futuroscope for the kids, as well as numerous cultural places of interest to visit. A new Water Park is set to open Summer 2016. There are plenty of leaflets and information I the gite to help you plan during your stay. The tourist Web pages for the Charente region offer lots of information. Booking Notes: Bookings are from Saturday to Saturday, however in non peak times we can be flexible. Arrival time from 5pm and departure before 10am, please, to allow for changeovers. A deposit of 20% is requested and the balance 8 weeks before arrival. Payment in sterling by bank transfer or Paypal is required. A security deposit of £250 is required with the final balance payment, and will be returned at the end of your stay if nothing is lost or broken and the house left as it was found. Changeover Day: In peak times, Saturday to Saturday is preferred to changeover, however, in non peak times, we are more flexible and can accommodate shorter stays and different dates. Notes on prices: For Bed & Breakfast stays, pricing is per double room. Unavailable in peak seasons, priced at 65 euros per room per night including breakfast. Bedlinen and towels will be provided. Guests are asked to bring beach or pool towels. For guests staying for 2 weeks or more, linen and towels can be provided each week. There is ample dining accommodation both inside the property and in the garden areas and a barbecue is available. A cot, high chair and stair gate are available on request.